The Sheikh Zayed Grand Mosque in Abu Dhabi is Much More than Grand! I had one primary thought when I visited the Sheikh Zayed Grand Mosque in Abu Dhabi, UAE. They need a better word than “grand”! Magnificent? Stupendous? Getting to the Grand Mosque isn’t the easiest. The bus system in Abu Dhabi isn’t integrated into Google Maps yet, and both the bus and mosque websites are confusing and unhelpful. I got lucky and was able to hitch a ride with a friend of a friend. Otherwise, the easiest way would have been to take a taxi for around 50 AED ($14), depending on where you’re traveling from, or find a bus tour like the Hop-On, Hop-Off Bus. Entrance to the Grand Mosque is free. Just make sure you dress appropriately. As a man, you will need to have your knees and shoulders covered. As a woman, you basically need everything but your face and hands covered. If you forget, you can always borrow clothes at the entrance. I arrived around 10 a.m., which was perfect as the crowds hadn’t started yet. After the security checkpoint and metal detector, I walked around the outside grounds. They cover a staggering 30 acres, a portion of which is currently under renovations for a huge garden with additional space for praying. The grounds are kept clean and pristine at all times. The mosque is located far enough outside of town so that few buildings mar the view. However, I was looking inward far more than I was looking out. The first key feature I noticed was the reflection ponds. They were gorgeous and I couldn’t stop staring at the mirror reflection they gave the mosque. However, I was to learn shortly that they serve a far greater purpose than mere decoration. The temperature in Abu Dhabi can rise above 50°C in the summer, and this can cause trouble with concrete and marble, the primary construction materials in the mosque. The pools act as a natural coolant, both for the stone and the air within the halls. I didn’t see any big fans or AC units, yet the air inside the mosque was quite cool and comfortable. Passing between the reflection ponds, I entered the outer foyer of the mosque. The decor and expanse were honestly difficult to fully take in and comprehend. 1096 columns surround the central courtyard. Each column is six-sided with gold-leaf covered palm leaves at the top. They support the 82 marble domes. Each side of the columns has three marble panels with semi-precious stones which have been inlaid with laser precision. In fact, they had to be 99.99% perfect to be used. This didn’t help speed up the construction, which took 11 years. That might be paltry compared to religious masterpieces like Notre Dame (182 years) or the Sagrada Familia (134 years so far), but that doesn’t make the Grand Mosque any less astounding. The central courtyard itself took a year and a half to complete. It measures 180,000 sq ft and has the largest marble mosaic in the world with countless tiny tiles going in to make up the floral pattern. It was hard to get a photo which took in the splendor in its entirety. The south, east and north sides of the main prayer hall have foyers you can enter through giant glass doors. Each foyer has yet more magnificent examples of stone-inlaid marble. The floral designs are based on the compass direction (northern, eastern or southern flowers). Then I entered the Main Hall. If the outer foyer was a lot to take in, this was something else entirely. The room is a staggering 108 feet high, with 96 columns supporting the ceiling. Hanging from the ceiling are seven massive chandeliers with Swarovski crystals. One of those chandeliers is the third largest in the world. Beneath them is the largest one-piece, hand-made carpet in the world. The carpet measures over 60,000 sq ft and weighs 35 tons. It’s composed of 2,268,000,000 knots, which took 1200-1300 workers nearly two years to complete. The carpet also has a Muslim feature I never knew about, which is the parallel ridges shaved into the carpet so that the worshipers can be arranged in straight rows as they pray. Another key feature of the main hall is the qibla wall with the gold-plated mihrab. I didn’t know anything about these before I took the tour. The qibla is the direction toward Mecca which all Muslims face when praying, and the mihrab is a semi-circular alcove which indicates the mihrab. The “minbar” is where the imam sits or stands, and is located next to the “mihrab.” Above the mihrab on the qibla are the 99 names of Allah. Beyond that were countless other features. More inlaid semi-precious stones everywhere. Recessed lighting highlights decorate the walls. So much attention to detail went into creating this marvel. One of the most incredible facts I learned from the walking tour was that the entire Grand Mosque is perfectly symmetrical. That includes the carpet, the stones, everything! This signifies, per the tour guide, the belief that all men are created equal. Very cool! The first tour started at 10, just moments before I arrived. This allowed me to explore on my own and take a bunch of photos, and I then jumped on the 11 a.m. tour. The tour lasts a little over an hour. The guide was rather humorous, and he took great care to debunk some common misconceptions and stereotypes applied to Muslims. I never bought into these myself, but I really liked the way he presented it. It wasn’t a challenge or invalidation to those with the false data, but merely a “by the way,” enlightening commentary. After the tour, I went to see Sheikh Zayed’s tomb, just to the west of the mosque. I wasn’t allowed to take any photos at this point, and there was a security guard following just a few steps behind me the whole time. What surprised me the most about the tomb is the recital which occurs there. A team of orators reads the Koran around the clock, over and over. You can hear it all around the grounds of the mosque. It takes about 36 hours to finish the entire book, at which point it’s begun again. Over and over. Wow! And that was it. It took me about three hours to fully explore the Grand Mosque, which means I’d recommend six hours for anyone else. I also had a chance to drive by at night, later in the week, and saw the building lit up on splendor with a massive lighting arrangement. As the evening is also significantly cooler than the daytime, this is probably the best time for you to visit. The mosque is open from 9 a.m. to 10 p.m. every day, except Friday when it opens at 4:30 after prayers. However, these times are significantly different during Ramadan. 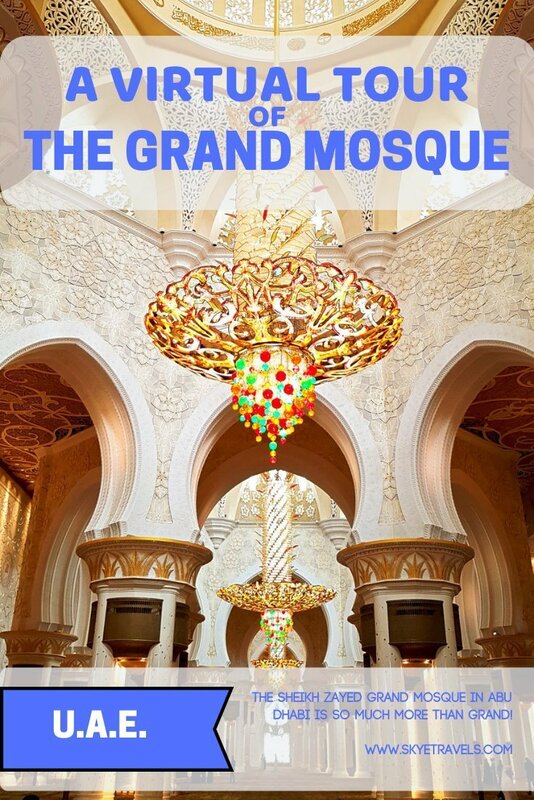 Go to the Grand Mosque website for more information. The Grand Mosque is just one of the many things to do in Abu Dhabi. The rest of my two weeks included visiting Yas Waterworld, trying to visit the Emirates Palace (and failing as I was wearing the wrong clothes), goggling at all the stupendous buildings and malls, and generally enjoying the beaches and sunny weather (although it was a bit too hot for me). Someday I look forward to going back to check off some of the other activities to do in town. Wow. It’s so detailed and clean! Breathtaking. I must add this item to my list! Thanks. You’re gonna love it! It looks so beautiful, I have to go there.